The FMS-Moisture/Pressure Headspace Analyzer is a non-destructive gas analyzer for simultaneously monitoring moisture partial pressure and total headspace pressure. 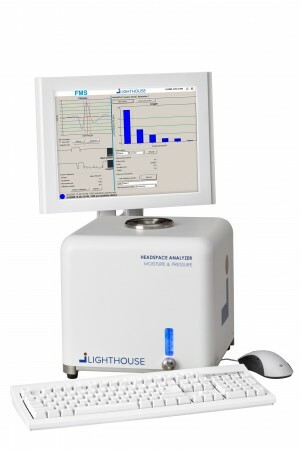 This compact benchtop instrument utilizes a patented laser absorption technique developed with funding from the Food and Drug Administration. The benchtop headspace moisture/pressure analyzer is used for development and QC laboratory applications as well as the final inspection of headspace moisture and pressure levels in production and/or packaging. Systems can be permanently situated in laboratories for product development, release testing, and QC investigations or mounted on carts and wheeled from line to line for in-process monitoring and troubleshooting activities.